Powerbanks are increasingly becoming a must-have accessory over the last few years and manufacturers are going to extra lengths the make their just that little bit more attractive to the rest. Be it, adding a flashlight, waterproofing, huge capacity or artwork. However, one company looks to be adding a particularly attractive feature, size. As capacities increase we see batteries getting bigger and more cumbersome, requiring a bag to carry them. 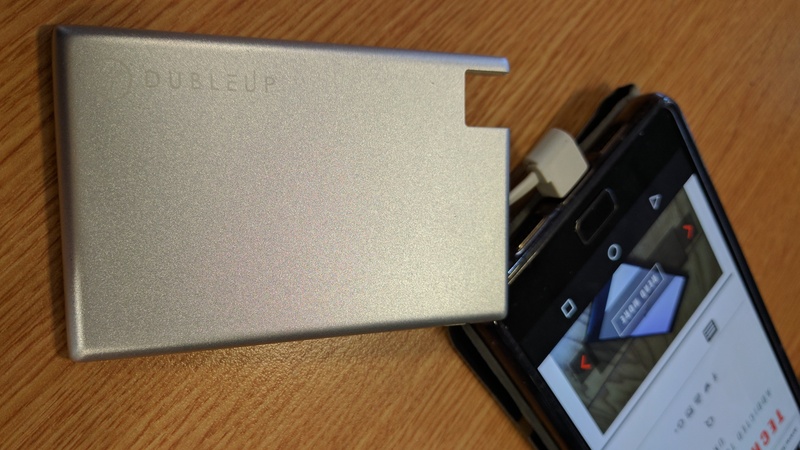 The Dubleup aims to be the backup battery that you can take with you at all times and whilst it’s not going to have your phone back to 100%, it will get you out of a spot. Designed to fit in your wallet or purse the Dubleup has most of the same proportions of a credit card. Save for girth, there is a battery in there so it has to have some girth. And whilst it might be as bloated as three credit cards piled on top of one another, that’s not exactly wide. Especially when you consider there needs to be a connector to charge the unit and a button to activate it. One the one side the charger has an attractive metallic look, available in three colours. Black, silver and pink. This is a tough and somewhat scratch resistant surface. A subtle logo is in place on the top left and there is a connector on the top right, more about this later. The understand is a little less elegant, however, this is the where all the action is. On the left is the charge cable and this is the Dubleup’s most commendable feature, the cable for your device is built right in, no need to carry one with you. A power button and some LEDs sit next to this and at the far right are some markings for capacity and output. There is little on the sides save for the input charge port. The one this that most will probably take issue with is that the capacity is 1280 mAh and this is lower than most phone batteries. Additionally, the output is 1A so no fast charging will take place here. Expecting your phone to be 100% after a 30-minute charge on the Dubleup is missing the point. This is designed to be in your wallet or purse to top up when battery life is grim. Perhaps when at a party on down in the bar with friends, somewhere that you don’t want to take a bulky powerbank with you and perhaps didn’t have the ability to charge your device over the course of the day, not everyone can. Slow to charge, and from 0% to around 38% the Dubleup was dead when I unplugged it from my phone 90 minutes after starting. Just enough of an injection of power to see me home. I was able to put the Dubleup back in my wallet and motor on for a few hours before going home. A bit of a life saver in the right hands. The Dubleup is a godsend, and not just for its slight footprint. The addition of the inbuilt charge cable is the icing on the cake and whilst options only cover MicroUSB and Apple Lightning connections this is an excellent addition to anyone’s wallet, purse or phone case! Hopefully, USB Type-C will be on the cards for the future. As a Kickstarter project, you can register your interest now on Dubleup.com and check out the Kickstarter page HERE. An Early Bird Offer is currently available. Get your Dubleup for just 60 AUD (around £36) or bag 2 for 100 AUD (around £60). Prices will include shipping.